Enigmas are a mysterious entity found in Super Mario RPG: Legend of the Seven Stars. 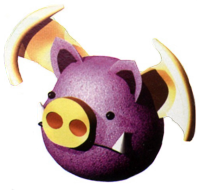 Although an Enigma resembles a large, purple bat with what looks like a pig's snout, the monster is actually a colony of smaller bats that come together to create one larger Enigma. Somehow, these bats can both think independently and combine their consciousnesses to act as one being. The large Enigma resembles the small bats that make the monster up. These bats can even detach themselves from the group and reform into different shapes, for example, an arrow. Enigmas are commonly found in the mines of Moleville. If an intruder enters their territory, an Enigma will form together and attack. However, Enigmas do not fight by themselves; they always fight with other monsters on their side. In a battle, an Enigma fights by separating part into smaller bats and attacking the intruder. They also know the spell Echofinder which causes the Mute status ailment, preventing an opponent from using special attacks. Enigmas are relatives of another bat-like enemy called Gorgons. Batton A play on 「バット」 batto, the English transliteration of "bat". This page was last edited on July 17, 2018, at 19:02.